The three optional pigs, all with lipstick. 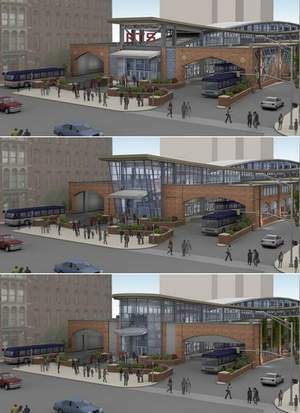 Last night the RGRTA (Rochester Genesee Regional Transportation Authority) held another public meeting to present the latest plans for the ill-considered Mortimer Street Bus Terminal, about which I have written at some length previously. This facility is unnecessary. If our bus company (not really a transportation authority – all the transit is gone from our city save for a bad bus system) ran the system properly, a centralized downtown facility would not be needed. At all. And if the facility, or some kind of transit transfer station, were to be planned intelligently, it would be located near other transit modes – like the intercity buses and trains at the Amtrak facility a few blocks away. Seems like the least the RGRTA should do. As it is we are about to spend $50m on a building and facility that we will have a good long time to regret (that’s an unbelievable $750 per square foot). I can only hope that it will be possible to repurpose the building once the bus system operates as it should. The plan is dreadful, over and above the fact that it shouldn’t even be considered in the first place. Things are in the wrong place, the traffic simulation is terrifying as pods of buses pulse from the proposed building at every cycle of the traffic lights, pedestrians are going to have to sprint to keep from getting flattened, the open space is in the wrong place, the curbside stop for the longer articulated buses (you know – the ones that won’t fit inside the proposed building….) is in the wrong place, and in general the whole project is most unfortunate. Many of us expressed our opinions last night, as we have before. Nothing changed from the last go-round, and I suspect nothing will change after this iteration. The boss at RGRTA, who is about to leave, seems hell-bent on getting this ridiculous project built. What a waste. I guess we just get to add this to the list of projects in our litany of bad city making here. Pretty sad.